"I did not really think, I just did it." 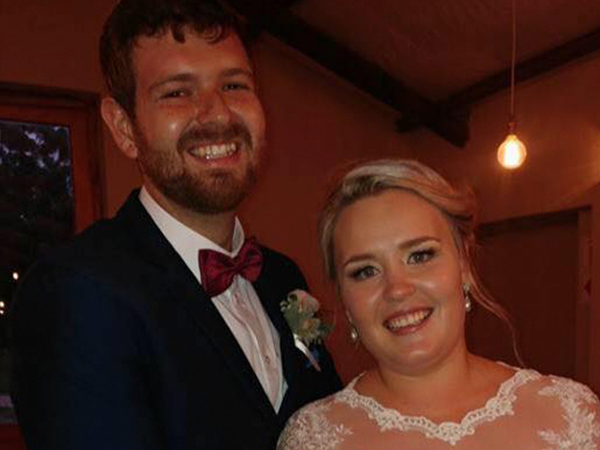 For this newlywed au pair from Bellville, Cape Town there was no way robbers were going to steal her wedding and engagement rings - so she swallowed them! And two days later, she could share some good news on her Facebook page: the rings were out and back in their rightful place -- on her finger. It was a traumatic experience, said Char-Denise Nel (22). "But we're just grateful we're safe." She and her husband, Fafa Nel (24) whom she married on 3 June, startled awake just after 2 pm last Saturday when they heard their dogs barking uncontrollably. Fafa went to investigate and found two men by the sliding door in the living room. They had broken the security gate's lock to get access to the house. Fafa ran back to close the bedroom door when two more men armed with knives emerged. He was forced into the bathroom. Char-Denise says she pulled the blanket over her head and hid under it while the men were searching their bedroom. Her mother-in-law, Martie, was in another room. "All that went through my head at that point was, 'Where is my husband, where is my husband? '," she says. "And I was afraid because you don't know when you could get stabbed on your side." One of the robbers grabbed her hand under the blanket, but she instantly snatched it away. These are my rings, nobody takes them, she thought to herself. Then she took off the rings and swallowed both. "I did not really think, I just did it," she says. The robbers then left with their TV set, laptop, two cellphones and a watch. When they realised they were safe, Char-Denise went to the bathroom where she pushed her finger in her throat. 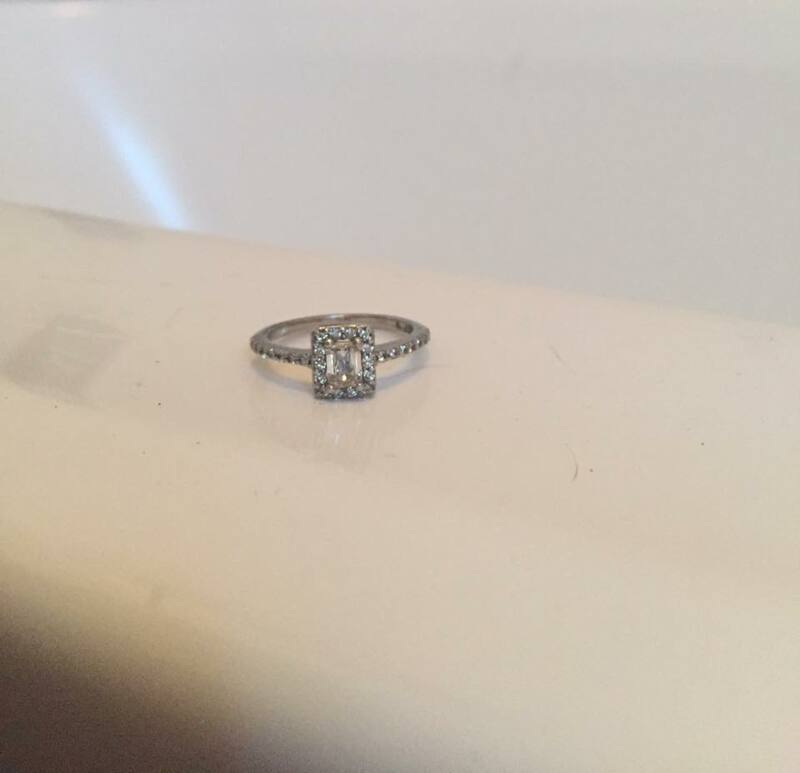 "The wedding band came out immediately, but my engagement ring was gone." The next day she and Fafa went to a local clinic where x-rays clearly showed the ring in her stomach. 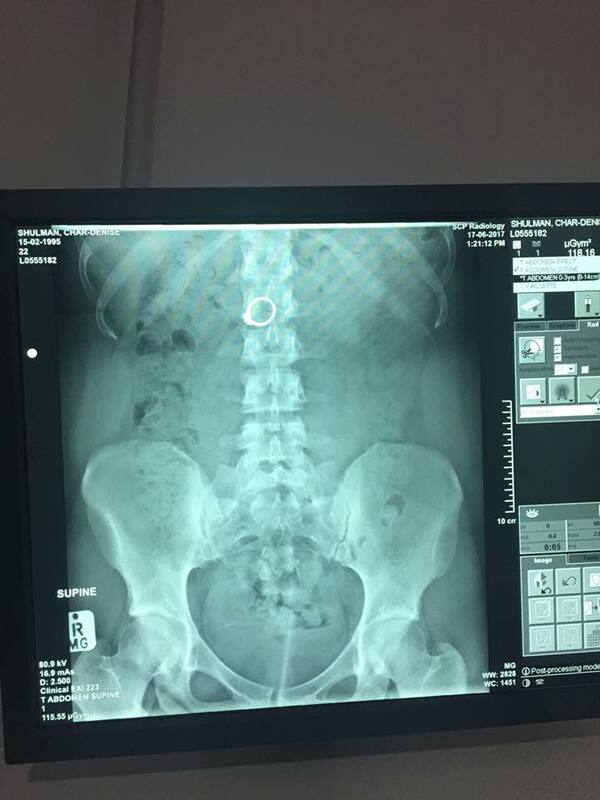 "The doctor said I don't have to worry, it will come out on its own." The doctor was right because on Monday morning she happily told her friends on her Facebook page: "Best day ever! Nice to see it again! My week was made."